Toshiba Research and Cambridge University in England are reporting that they have succeeded in building the first conventional fiber-optic network that’s capable of transmitting and receiving both quantum data (for encryption) and normal high-speed binary data. 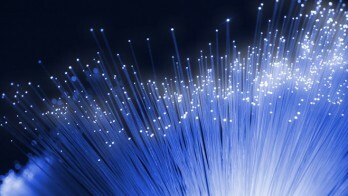 This breakthrough means that the world’s fiber networks can now be secured with theoretically unbreakable encryption. Now, quantum-secured networks aren’t particularly new, but until now the single photons (qubits) have required their own dedicated optical fiber for transmission. In conventional fiber-optic networks, the transmission of data is very intense, with over 1 million photons carrying a single bit of binary data. Sending single photons down the same fiber simply wasn’t feasible; it was impossible to extract that single photon at the other end. Until now! Toshiba/Cambridge QKD + fiber data network diagram. A = the overall setup. B = the quantum transmitter. C = the quantum receiver. The Toshiba and Cambridge researchers have overcome this restriction by transmitting the quantum photons and data signals at different wavelengths, and by using a special photodetector at the receiving end that turns on for just 100 millionth of a microsecond (a few hundred femtoseconds). The different wavelengths mean that the signals don’t clash, and the photodetector only turns on when it expects to receive a single photon. The end result is a fiber network that can transmit binary data at 1Gbps in both directions, and perform quantum key distribution at 500Kbps at the same time, over a 90km (56mi) length. This is apparently 50,000 times faster than the previous best QKD over a fiber network of this length. 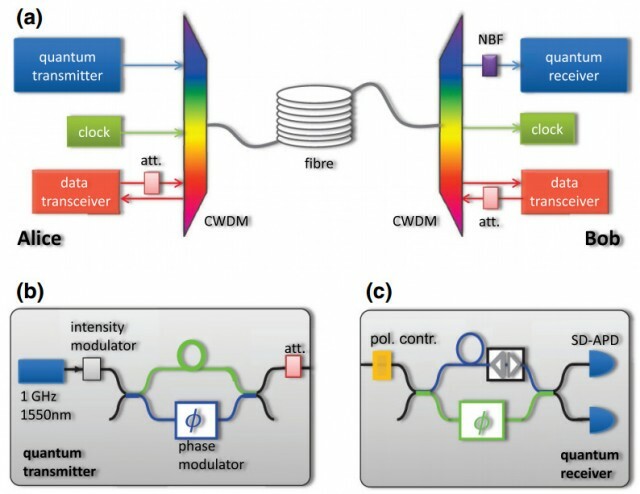 In theory, this means that the next generation of fiber networks — assuming this femtosecond photodetector can be implemented commercially — could be secured with quantum cryptography. Most importantly, we’re only talking about new routers — this method of QKD could be performed on existing (and very expensive) fiber networks. The immediate benefit will be for military and police/security networks, and domestic infrastructure (think secure communications in smart cities). With fiber steadily rolling out to consumers, though, you and I might soon be downloading torrents and watching cat videos that have been encrypted with quantum cryptography. Check out popular story on the secret world of submarine fiber-optic cables.